Grief is the painful process of adjusting to a loss. This collection of meditations is designed for anyone experiencing loss, whether it be the death of a loved one or the loss of health, financial security, or relationships. Each reflection focuses on a different topic, moving readers from acknowledging pain and loss to healing and new life. Using Scripture and prayer, Simsic gently shepherds readers through difficult issues like forgiveness, shock, depression, and the fear of letting go, without ever resorting to shallow sentimentality. This expanded version of the original book, Cries of the Heart: Praying Our Losses, features additional meditations and photographs from nature. 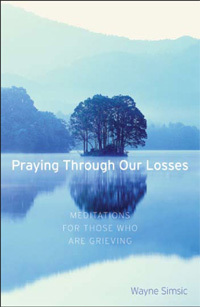 A wonderful resource for people going through times of loss as well as for those looking for a gift to comfort family or friends.